As promised a few weeks ago, Skype has released its new version for Windows with complete Facebook integration making it possible for users to SMS, chat or call their Facebook friends via Skype right from their News Feed area which now has a Facebook tab. 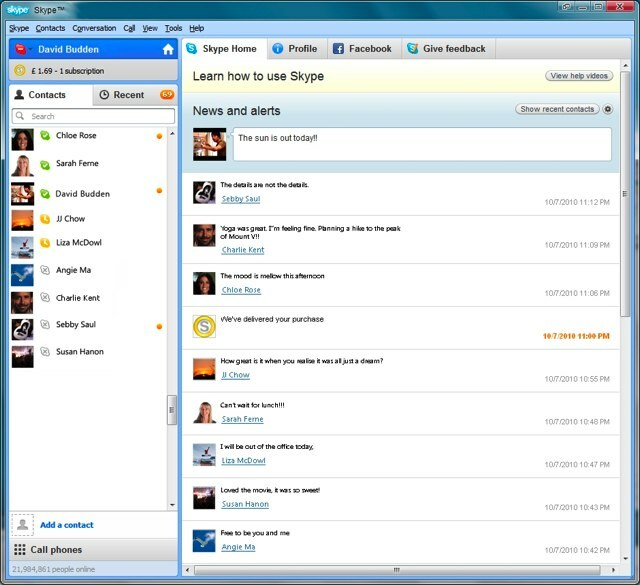 Skype 5.0 has a large number of improvements and added features to make the experience more Facebook friendly. The new interface is pretty and sleek and you can click the home icon in the Skype Home area of the application to see the new expanded Home area with news, alerts and mood messages. You get all your Facebook News Feed in this very area and your Phonebook too. If the friend is a mutual connection on Skype, you’ll also have the option to initiate a free Skype call. And, if the Facebook friend is not already a Skype connection, but both of you are on Skype at the same time, the same free Skype call option is visible and an additional plus button will show up so you can add the Facebook friend as a Skype contact. The new Skype also allows 10-way group video calling and now has a “dynamic view” option that automatically positions the person speaking in the larger video window. Its automatic recovery feature will get disconnected audio and video chatters back online within seconds. Skype has promised that a Mac version of 5.0 is coming soon though they can’t confirm the date. Better late than never.